Founded in 1869, the 265-acre cemetery is home to more than 100,000 people (with more than 700 added each year and 70 acres remaining for future development). It’s Cleveland’s version of Green-Wood or Woodlawn, built at the tail-end of the rural cemetery movement. Located in the neighborhood of Cleveland Heights, a view of Lake Erie can be had when looking north from the cemetery. 20th President James A. Garfield is interred at Lake View inside of an exquisite mausoleum. The sandstone structure, dedicated in 1890, stands 180 feet tall and includes five, terra cotta panels comprising more than 110 life size figures depicting Garfield’s life and death. Garfield was shot by the disgruntled (and probably insane) Charles J. Guiteau at a train station in Washington, D.C. in 1881. After eleven weeks of poking and prodding by a team of well-meaning—but misinformed—doctors, Garfield died of infection, the second of four presidents to be assassinated (this is an excellent book about Garfield’s presidency and his gnarly death). Unfortunately the monument was closed when we visited (a good excuse to come back in warmer weather! ), but the Memorial Hall includes mosaics, marble, stained glass windows, a statue of the President and 64 steps leading to an outdoor balcony. Interred within the monument alongside President Garfield—the only Presidential casket currently on full display—are his wife Lucretia, their daughter and her husband. Lake View is home to several other famous residents, including John D. Rockefeller, Carl B. Stokes, the first African American mayor of a major US city (Cleveland) and Alan Freed, the radio DJ who popularized the term "rock and roll." Freed, who died of complications from alcoholism when he was just 43 years old, was initially interred at Ferncliff Cemetery in Hartsdale, New York. In 2002, his ashes were moved to the Rock and Roll Hall of Fame in Cleveland but in 2014, the Freed family re-interred his ashes at Lake View, beneath a headstone cut to look like a jukebox. It was freezing on the day we visited and we didn’t have much time to poke around, but there was one statue I had to see before I left Lake View—The Haserot Angel. 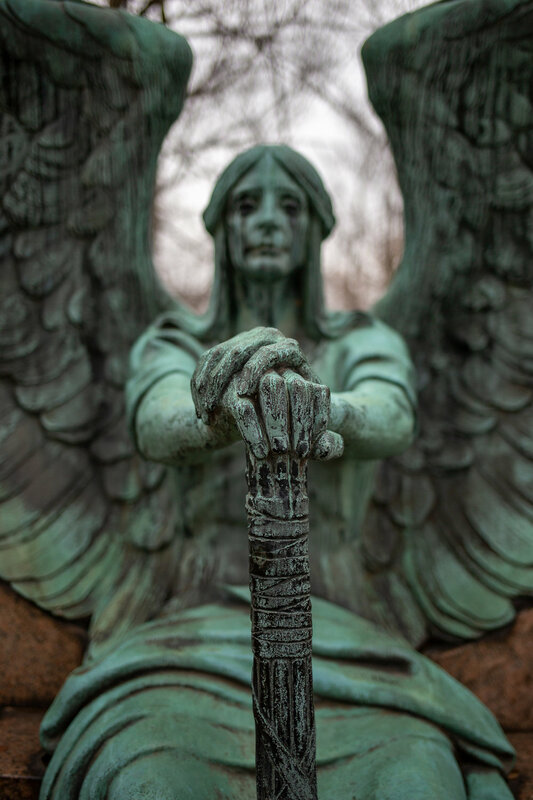 “The Angel of Death Victorious,” sits on a marble monument marking the graves of canning entrepreneur Francis Haserot and his family. 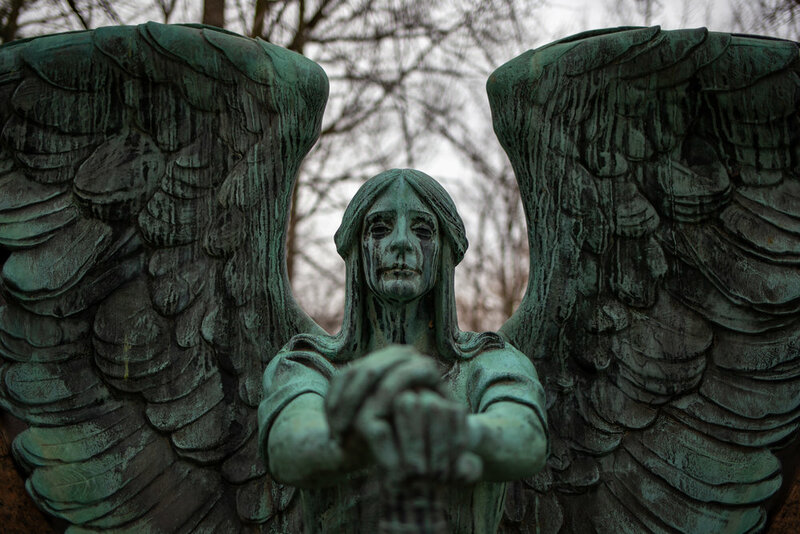 The life-size bronze angel holds a torch upside-down, symbolizing a life that has been extinguished. Sometimes referred to as the “weeping angel” because of the black “tears” that have formed on her face over the years, the Haserot Angel is even more lovely—and haunting—in person than I expected.